August 25, 2016, 10:36 AM · SHANGHAI -- What exactly happens when a person hears the same concerto 18 times over two days? 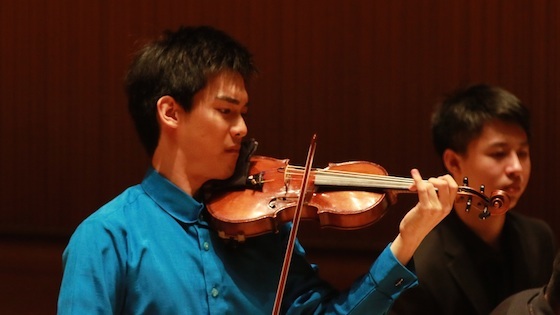 I wondered about this today at the Shanghai Isaac Stern International Violin Competition semi-finals, as I looked over at the jury, listening to the 10th of 18 performances of "The Butterfly Lovers" Violin Concerto by Zhanhou He and Gang Chen. Surely there is a doctoral dissertation waiting to be written about what happens to the brain when subjected to multiple hearings of the same piece. For example, I'd heard this piece only a few times before coming to Shanghai. 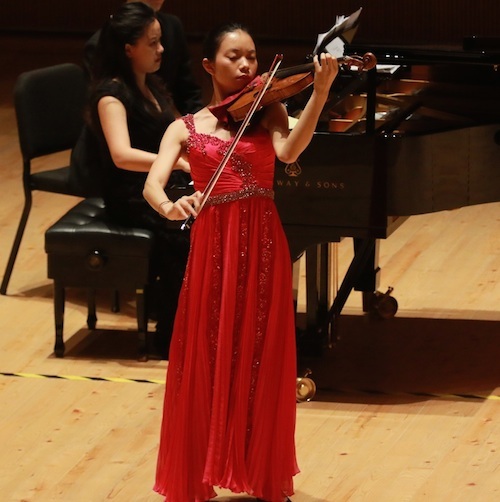 It's an East-meets-West piece that brings Chinese elements into Western classical music. A good Chinese-American friend of mine had been begging me for years to check it out; she loves the piece. Check it out I did -- 18 times in the last two days! The first time I heard the piece yesterday, I enthusiastically took copious notes; by the 10th time my pen was down; I could predict each moment in the score. And yet, I could not predict each moment in the music. If only a computer animated the score, then I could. But every human plays it differently. It's the same reason I don't get bored with my students, who play the same pieces, week after week, year after year. I teach them, not the music. In this case, we had 18 violinists from all around the world -- truly some of the finest young violinists who are playing right now. (Listen to the archived performances by clicking here.) They came from the U.S., from Germany, Italy, Russia, Japan, South Korea, Azerbaijan and of course, China. Reading their bios, they've had teachers from so many places I can't begin to count them. And then there are their violins and bows -- their voices -- some made hundreds of years ago, some made more recently, borrowed or bought from all over world. I didn't know everyone's instrument, but there were Strads, a del Gesu, a Guadagnini and more. It was anything but boring to hear these musicians play this piece, and to see how differently their interpreted it. 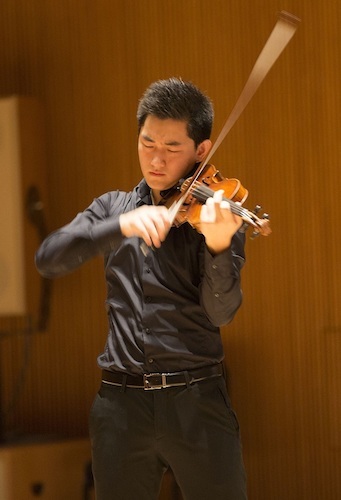 And putting the intense focus on that particular piece seemed appropriate for a competition taking place for the first time, in a hall built just two years ago in Shanghai-- home to the oldest symphony in China, the Shanghai Symphony Orchestra, founded in 1879. They also each played a sonata with piano, and today we heard ones by Beethoven, Schumann, Faure and Prokofiev. The two semi-finalists from the United States were actually the very last to play this evening, but I'll go in reverse order. Sirena Huang (whom we've seen at many competitions, including Montreal, and when she was very young, at Starling-DeLay) played that 18th Butterfly Lovers concerto with energy and commitment. She also played Beethoven's Sonata No. 7, which seemed a good match for her musical personality - spritely and with energetic bounce. Sirena Huang of the U.S.A. Photo by SISIVC. Richard Lin, a former student of Aaron Rosand at Curtis and Lewis Kaplan at Juilliard, had an easy, un-forced and hurried approach to the Butterfly Lovers concerto that captured its changing moods. He also played Schumann's Sonata No. 1, well-articulated and artful. Richard Lin of the U.S.A. Photo by SISIVC. Ming Liu of China got me thinking about the general Chinese tradition that I noticed for the "Butterfly Lovers" among those who had studied in China, an approach with more moments of stillness, and more inflection that mimics the sound of Chinese language and traditional music. To be sure, this was present in varying degrees in non-Chinese players, but it makes sense that there is tradition tracing back to the piece's 1950's premiere in China by Lina Yu, who is a jury member in this competition and has taught since 1962 at the Shanghai Conservatory. There were two fantastic performances of Prokofiev's Sonata No. 1 in F, one by Stefan Tarara of Germany (former student of and assistant to Zakhar Bron) and another by Sergei Dogadin of Russia (who won the Hannover competition in 2015.) I'm glad I'm not a jury member who has to decide between them - different but each so compelling. Tarara showed a gift for creating long musical lines in this music that is so full of gestures. Dogadin was a wonderful storyteller -- the kind who makes you hang on every word and brings out the flavor, drama and detail so you can laugh and cry. Wendy Wang of China had such a silvery opening to her version of the "Butterfly Lovers," something she returned to in every slow section. On the other side of it, at the frenzied end of the piece she was just wailing, the storm before the lovers become butterflies and float away on a harmonic. Elvin Ganiyev of Azerbaijan played with guts, expression and good trills, though the amount of control he had was uneven at times. Zeyu Victor Li of China. Photo by SISIVC. Li brought the spookiness of the third movement, evoking sounds that make me think of a calm walk among dark shadows then a kind of merging with the shadows, or a bubbling potion. His Butterfly Lovers Concerto had a lot of energy and abandon - and for a moment I felt I heard that Chinese Opera sound. It made me wonder if the Butterfly Lovers Violin Concerto has been used for telling the story through dance or a music video - surely it has? If not, it's just waiting to happen. Andrea Obiso played that same Prokofiev with elegance, grace and control; he also had a wonderfully varied vibrato that ranged from none at all to something very robust, with a lot in between. Are you convinced yet? Go watch the performances! I will be in Shanghai for the rest of the competition, ending Sept. 2. The next stage, Aug. 28 and 29, are a continuation of the semi-finals in which every candidate must play Mozart Concerto No. 3 -- but with their own cadenzas! I'm looking forward to hearing what they come up with. Finals will be Sept. 1-2, with finalists playing one virtuoso piece and one Romantic or modern concerto. Tomorrow: Laurie gets over jet lag and attempts to take a look at this city without getting lost! August 25, 2016 at 06:55 PM · Being a Shanghainese and grew up during 60s, I always associate "The Butterfly Lovers" with Shaoxing xi (drama from the Shaoxing area near Shanghai). And to my ears, the relationship between this violin piece with the Shaoxing xi called "Liang Zhu" is very similar to that of Carmen Concert Fantasy and the opera Carmen. I wonder what He Zhanhao and Lina Yu would say about this. August 26, 2016 at 12:28 AM · Yixi, the composer mentioned it being based on "Shaoxing Opera" -- are they the same thing? Thanks for this link! August 26, 2016 at 04:14 AM · Yes, Laurie, they are the same thing. August 27, 2016 at 06:18 AM · Laurie, I enjoyed your statement that listening to the same concerto 18 times was not boring because each performance was by a unique person with unique ideas and feelings about the piece. Music is universal but it is also intensely personal. Thanks also for your commentary on the individual performances.